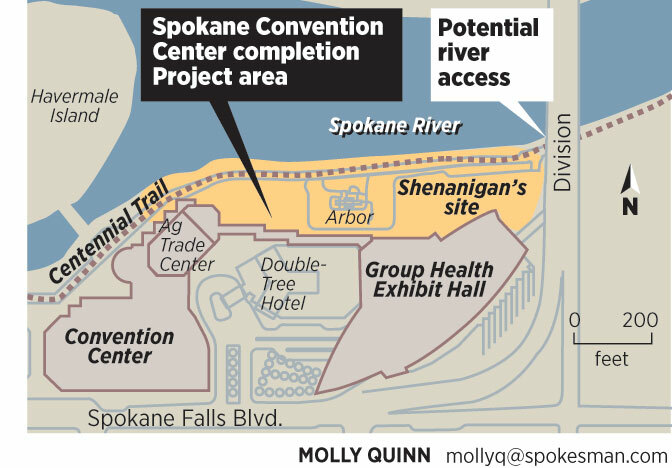 The voter-approved $65 million project to expand the Spokane Convention Center involves the Centennial Trail and shoreline improvements. Designs are set to be approved in 2013. Tree-lovers, Centennial Trail users and Spokane River paddlers will be the first to notice if preliminary construction for the $55 million Spokane Convention Center Completion Project begins as scheduled next week. Workers plan to close the Centennial Trail from Division Street west to the King Cole Bridge in Riverfront Park through mid-November for sewer line installation, said Kevin Twohig, Spokane Public Facilities District executive director. The trail is a passive provider of recreation on a huge scale. City Parks director Leroy Eadie said eight public events scheduled to use the Centennial Trail will be routed around the sewer project and three events will have to be moved. That’s just the organized activities coming up – in the offseason – hinting at the Centennial Trail’s priceless passive value for recreation in Spokane. Kudos to the Park Board for insisting that the trail be prominent in the planning for the voter-approved Convention Center expansion. Some of the trees lining the Spokane River will be removed during the sewer installation, contractors told a Spokane Park Board subcommittee Monday. While mature London planetrees south of the Centennial Trail will be saved, most of the willows along the shoreline north of the trail will be removed, said Clancy Welsh of Garco Construction. Roots from some of the non-native willow trees are buckling the trail’s asphalt surface while others are deteriorating, he said, citing an arborist’s report. Planned improvements include repairing damaged and eroded riverbank, adding viewpoints and removing non-native plants such as blackberry bushes and weeds. More than 75 new trees will be planted in the shoreline restoration project including native ponderosa pines, aspens, cottonwoods and about 1,300 smaller plants, Twohig said. After installing 800 feet of new sewer line under the Centennial Trail, the route will be recapped with asphalt in two phases, Welsh said. The first layer will be paved this fall so the trail can be used. Another layer will be applied next year after Convention Center construction and river shoreline improvements are complete, he said. Given time, this 1,000-foot section of the Spokane River shoreline could be more beautiful than ever. But time is running out on another feature impacted by the Convention Center expansion, which affects the existing boat access to the river near the defunct Shenanigan’s restaurant. The future of the informal boat take-out under the Division Street Bridge continues to be an issue for paddlers, river advocates and some Parks Board members. The access is critical to existing uses, ongoing water trail development and guides and programs that could serve Spokane – including future Convention Center customers. Yes, access to the river take-out must be blocked during this fall’s sewer installation. However, board member Andy Dunau said the Public Utilities District has balked at a formal commitment to keep the site viable for boaters after the Convention Center expansion is complete. “It’s like Charlie Brown and the football,” he said. “We have heard repeatedly that the PFD is committed to having a boat access, then to be given reasons why they can’t. I just put it in writing, but he hasn’t. In a recent media release, Twohig emphasized, “The District clearly understands the importance of the Centennial Trail and the river.” However, he otherwise has made it clear the boat access is not a high priority. River users say a river without access is like a convention center with barricaded doors. Keeping the river accessible from the Convention Center for water-related activities such as guided raft trips and paddle boarding would be a boon not a burden. It’s a selling point. Protect it and promote it. PFD representatives have suggested that boat access is low on their list of concerns in a $55 million project. That’s probably what the proponents of Grand Coulee Dam said when some minion scientist suggested a fish ladder should be built to maintain salmon access to the upper Columbia River. Rick Eichstaedt, a Center for Justice-Spokane Riverkeeper attorney, said he’s still waiting for assurance the boat access will be developed.